This question is fairly easy to understand. 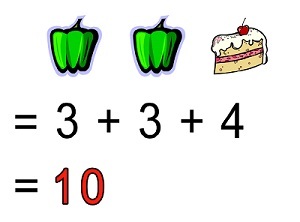 The green pepper has a value of 3 and the cake has a value of 4 so the answer is 10. This question is a little more complicated. There are 2 sets of information. The second set of information is actually part of the first set. 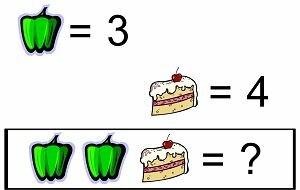 By putting both sets of information together, we can deduce the answer. This question is also a little complicated. 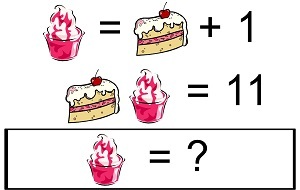 From the first set of information, we know that the value of the ice cream is 1 more than the value of the cake. 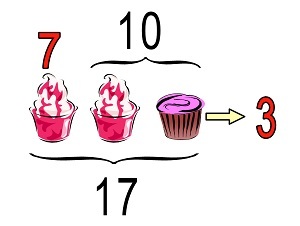 The second set of information tells us the sum of the numbers is 11. 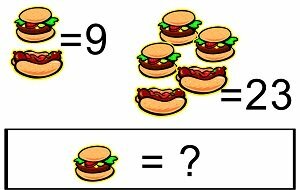 To solve this question, we employ a method called guess-and-check. 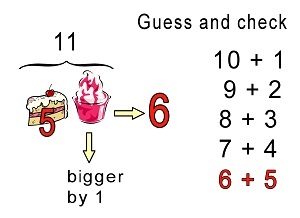 That is, we write a list of pairs of numbers that give a sum of 11. The list doesn't have to be complete. We then look for a pair of numbers where the difference is 1. We know the artichoke has a value of 7. 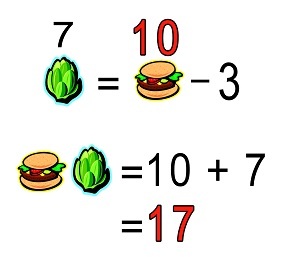 The second set of information tells us that the value of the artichoke is 3 less than the value of the hamburger. 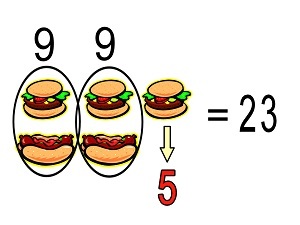 Thus we can work out the value of the hamburger as 10 because 7 is 3 less than 10. 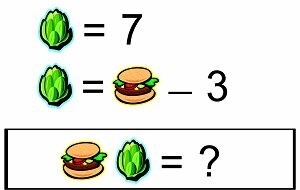 Now we can work out the final answer, which is 17. 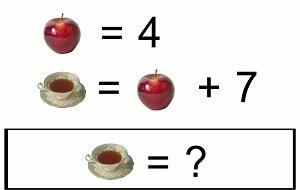 This question looks very complicated unless you know the secret. The key is that the first set of information is actually part of the second set. Combine the two sets of information together and the solution is clear. 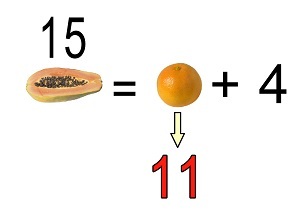 The papaya has a value of 15. 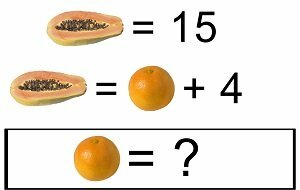 The value of the papaya is 4 more than the value of the orange. The value of the orange has to be 11. 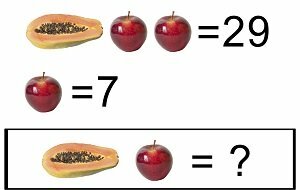 One way to solve this question would be to find out the value of the papaya first, and then add the value of the papaya and the apple. 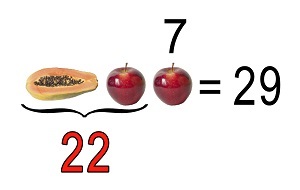 A faster way would be to take away one apple from the set of papaya and two apples. 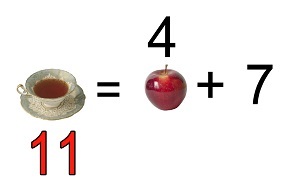 Which item has a bigger value, the apple or the tea? Once you figure that out, you will know how to find the answer. This is a 2-step question. 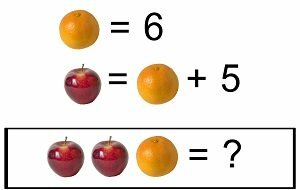 First you have to find the value of the apple, then find the total of the 2 apples and 1 orange. 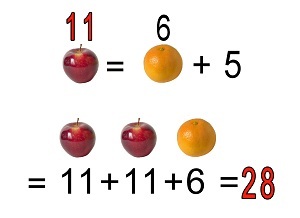 The apple has a bigger value than the orange, so it's value is 11. 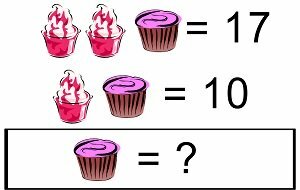 If you would like to have more fun Math questions, please let me know by using the contact form here.